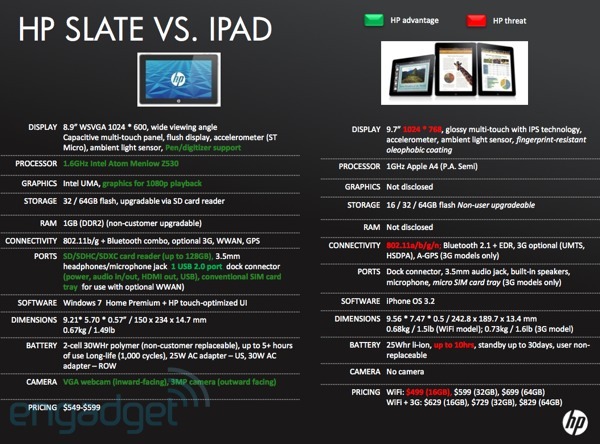 Its going to be an awesome fight between HP Slate ‘vs’ Apple iPad. In this fight between the slate vs ipad, it will be you who will decide the winner to be with Apple leading the score by about 300,000 plus sales. Our friends at Engaget were able to get their hands on an internal presentation of the HP slate to its employees inorder to reduce the hype created by the ipad. HP sure wants its employees to reamin faithful to it and not have a situation where Microsoft had about 10000 employees hopelessly addicted to its rival, the iPhone. The config is extremely competitive and interesting. The basic version of the slate is set to retail at $549 and comes with a 32gb Storage, 1.6 Ghz Atom processor, 1 GB ram and an 8.9 inch multitouch screen. The screen is set to pump up a sweet 1024 x 600 pixel resolution. More disk can be added for a higher price. Another 50 bucks will get you a 64GB of storage. While iPad starts at $499 for 16GB of storage, HP doubled the storage and bumped the price to 549$. The slate comes with other features that might drive you away from the iPad. An SDHC card slow, USB port, Two camera’s – one external 3-megapixel and one front facing VGA for video conferencing, Wi-Fi, Bluetooth, GPS, support for 1080p video, docking station, audio and HDMI out, and a SIM card slot for optional 3G connectivity. The Slate will run Windows 7 Home Premium loaded with a custom HP touch-optimized user interface. Battery life is reporptedly five hours while iPad offers a batter life of 10 hours. With so many extra functionality thrown into it battery life tends to decrease but it sure is better than a laptop which typically lasts for 3 hours or less unless you have an extra battery pack. Slate is also reported to be released at the end of June. It is always best to have a multipurpose machine rather than something that looks and feels good but does not offer multipurpose functionality afterall Isn’t that the purpose of a computer, to do about everything what we want it to? Next Pink phone to be released next week!